Did we just say goodbye to the greatest generation? HOUSTON – The funeral service for George H.W. Bush at his hometown church Thursday was a farewell to a friend, a neighbor and a former president, to be sure. A day earlier, at Washington’s National Cathedral, historian Jon Meacham called Bush “America’s last great soldier-statesman, a 20th-century founding father,” one in a line of presidents “who believed in causes larger than themselves.” Bush was the last president to have served in combat. It was author and TV anchor Tom Brokaw who dubbed it the Greatest Generation, the Americans who had survived the Great Depression and then fought in World War II. That conflict was the formative experience for many, including George Herbert Walker Bush, a son of privilege from Greenwich, Connecticut. His determination to accomplish something big in his life, something meaningful, was fueled when he survived being shot down over the Pacific and his two crew members didn’t. Former White House Chief of Staff James Baker after he gave a eulogy at the funeral service for former President George H.W. Bush at St. Martin's Episcopal Church in Houston, Thursday, Dec. 6, 2018. Bush was one of the youngest Navy pilots when he enlisted on his 18th birthday, in 1942. He ended up living to age 94, old enough to see many of the classmates from his prep school and the men in his squadron and his colleagues in Congress pass away. He died last week at his home here, a few blocks from the spired church he had attended for a half-century. At the St. Martin’s Episcopal Church service Thursday, the friend who made the plaque was sitting in the pews. Dan Gillcrist was a junior business executive and a former submariner when he volunteered for Bush’s early Senate campaign, a travel aide to the candidate as he crisscrossed the state. Years later, when they saw each other at the funeral for another Navy man, Bush admired the CAVU sign placed near his casket and asked Gillcrist, an amateur wood craftsman, to make one for him. Gillcrist ended up making several of them for Bush over the next decade or so to display in his homes and give as gifts to foreign dignitaries and others. He understood why the phrase meant so much to the former president. The service at the cathedral Wednesday had been grand and global, five presidents and dozens of foreign dignitaries in attendance. The service at the church Thursday had a cozier feel, though every seat was taken. 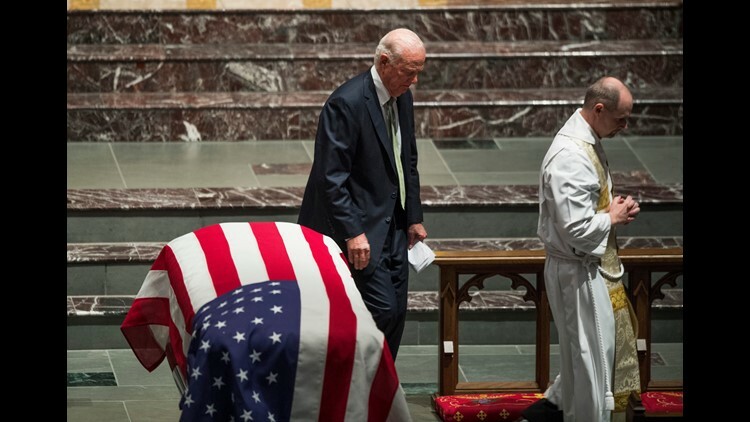 The tributes were delivered by Baker, his best friend, and by George P. Bush, his oldest grandson and the one who carries his name. George H.W. Bush had moved back to Houston after the worst political defeat of his life, crushed after losing the White House to Bill Clinton, a man he then saw as undeserving of the Oval Office, although they later became close friends. When he and his wife, Barbara, landed at Ellington Air Force Base in late afternoon on that difficult Inauguration Day in 1993, they had been cheered by the sight of store signs welcoming them and well-wishers lining the route to the house they had rented while a new one was being built for them. Former President George H.W. 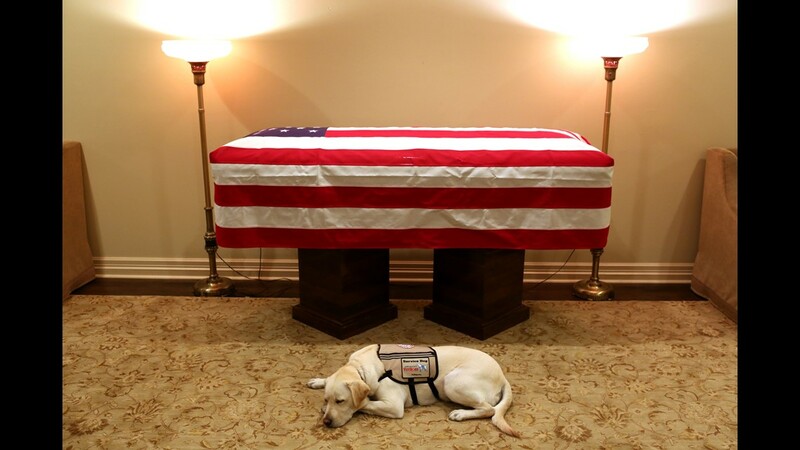 Bush's service dog, Sully, lying in front of his casket on Dec. 2, 2018. 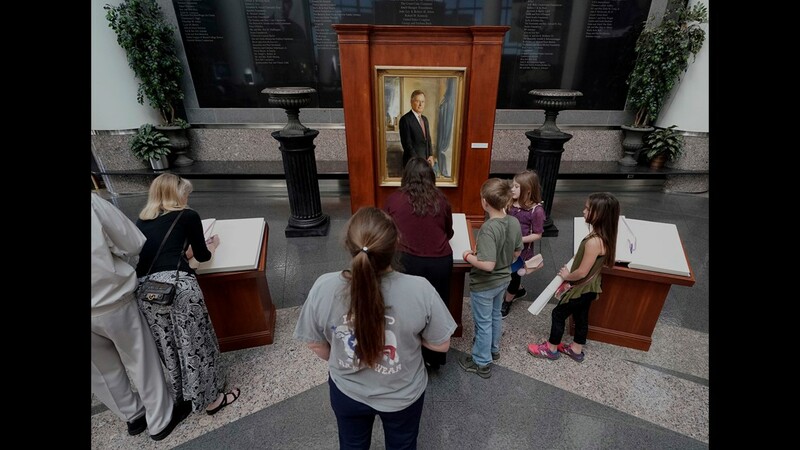 A guest to the George W. Bush Presidential Library and Museum in University Park, Texas passes by a painted portrait of Bush's father, the late 41st President George H.W. Bush -- painted by former Pres. George W. Bush -- and a memorial wreath, Sunday, Dec. 2, 2018. 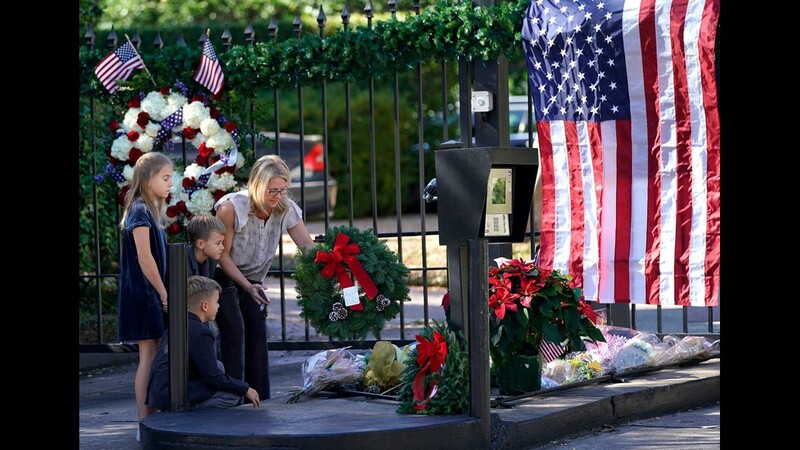 Tiffany Utterson, right, and her children, from left to right, Ella, 11, Ian, 10 and Owen, 8, place a wreath outside the gated community entrance to the home of George H.W. Bush Sunday, Dec. 2, 2018, in Houston. 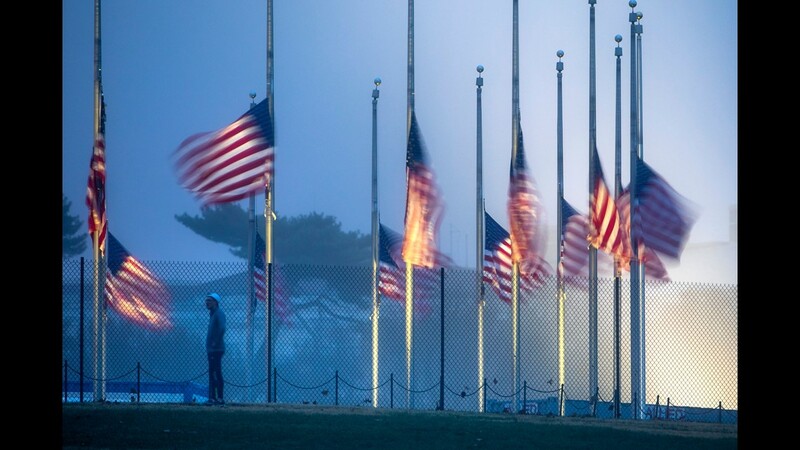 Flags on the National Mall fly at half-staff to honor the passing of former President George H.W. Bush in Washington, Dec. 1, 2018. A statue of George H.W. Bush with flowers stands near downtown in Houston, Dec. 2, 2018. A moment of silence is observed in the memory of former President George H.W. 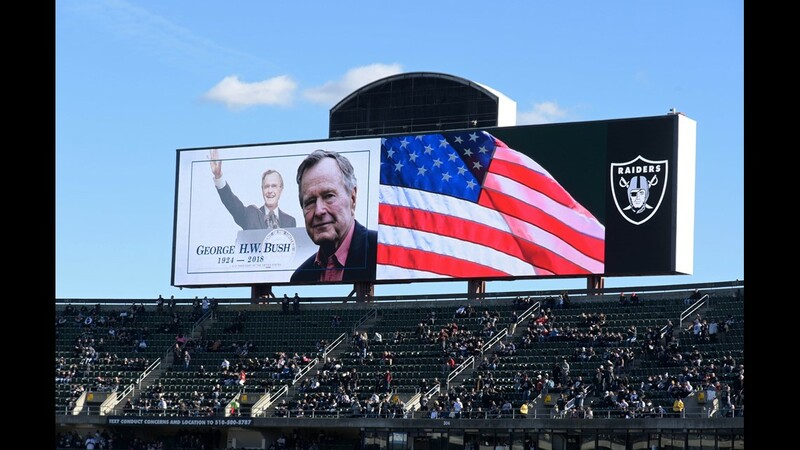 Bush during the NFL game between the Kansas City Chiefs and the Oakland Raiders in Oakland, Calif., Dec. 2, 2018. 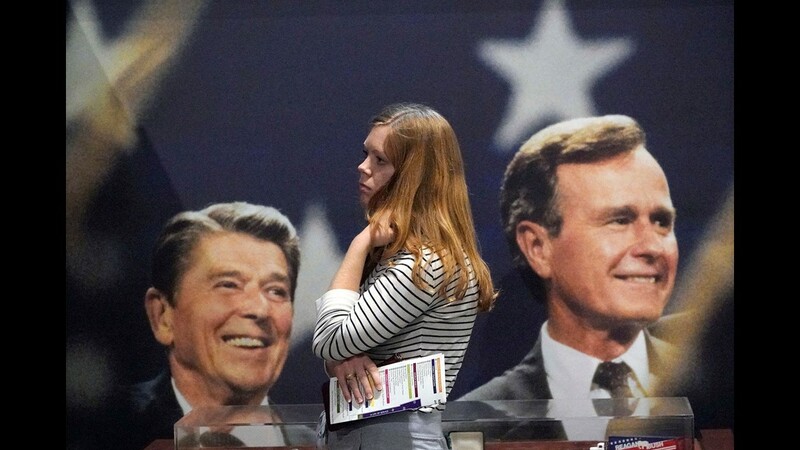 Caroline Cyboran, of Kingwood, Texas, looks at an exhibit while visting the George H.W. Bush Presidential Library and Museum Saturday, Dec. 1, 2018, in College Station. Bush has died at age 94. Family spokesman Jim McGrath says Bush died shortly after 10 p.m. Friday, Nov. 30, 2018, about eight months after the death of his wife, Barbara Bush. 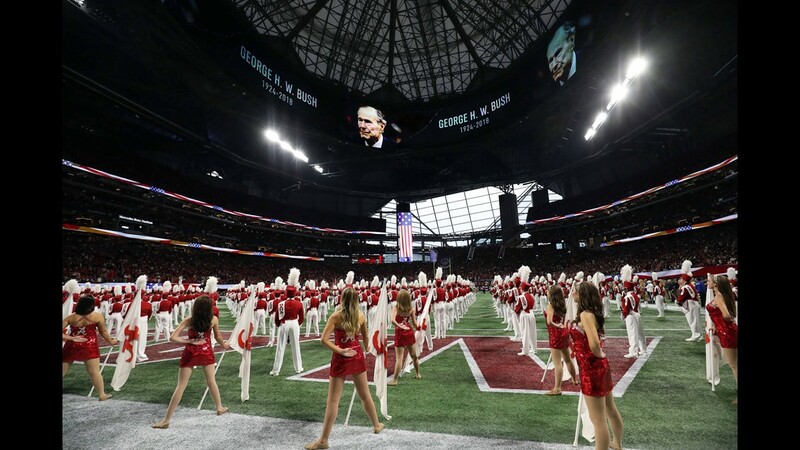 President George H. W. Bush is honored prior to the SEC championship game between the Alabama Crimson Tide and the Georgia Bulldogs at Mercedes-Benz Stadium. 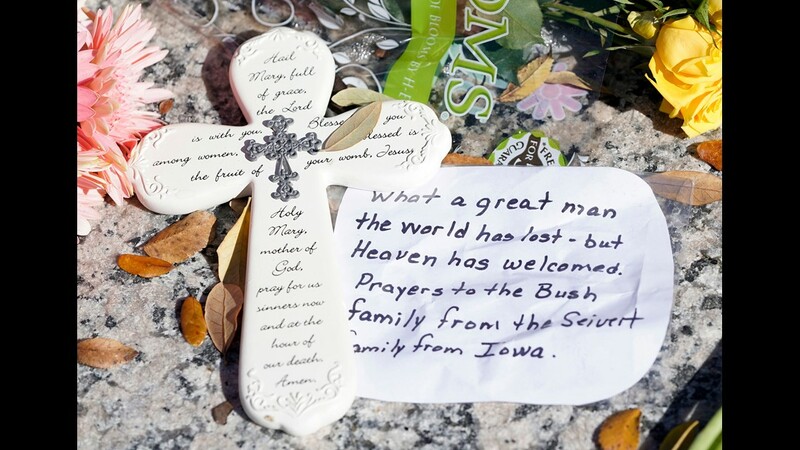 A messages lies among flowers left at the base of a statue of George H.W. Bush outside the George H.W. Bush Presidential Library and Museum Saturday, Dec. 1, 2018, in College Station. 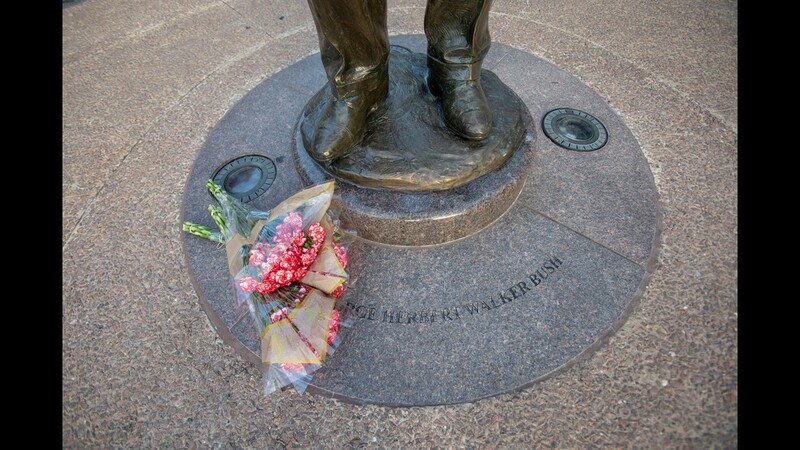 Flowers are placed at the foot of a statue of George H.W. Bush outside the George H.W. Bush Presidential Library and Museum Saturday, Dec. 1, 2018, in College Station. 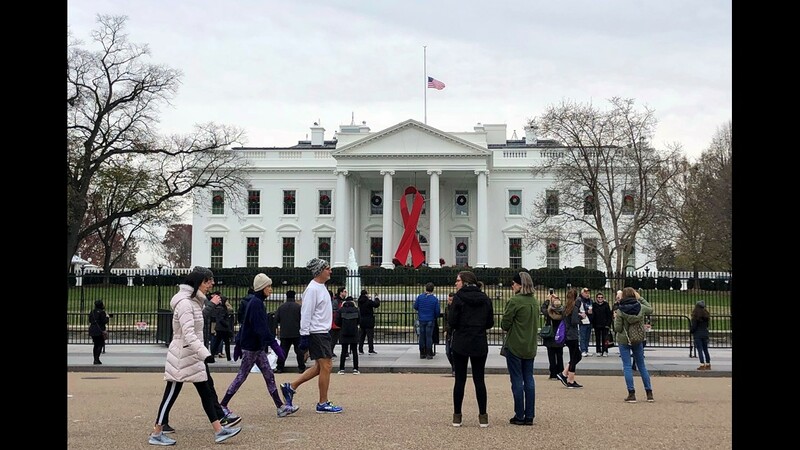 The US flag flies at half-staff at the White House in tribute to former US President George H. W. Bush, on Dec. 1, 2018, in Washington, DC. Bush, who guided the US through the end of the Cold War and launched the international campaign to drive Iraqi strongman Saddam Hussein's forces from Kuwait, died on November 30, 2018, at his home in Houston. He was 94. 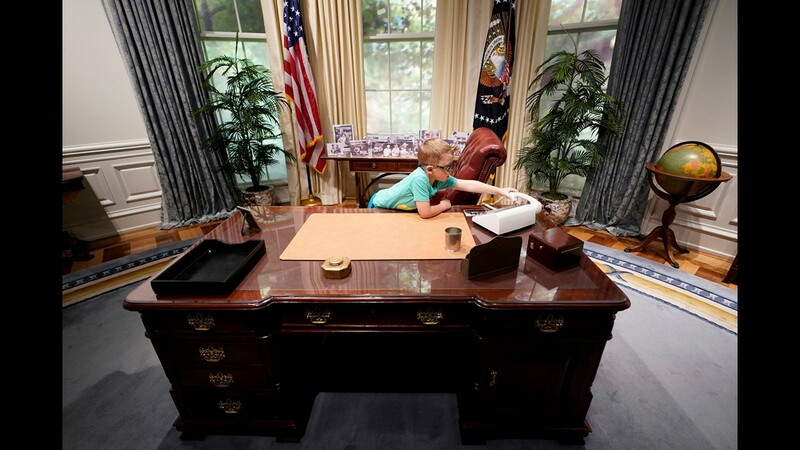 Kalob Duke, 6, of College Station, Texas, sits behind the desk in a replica of the Oval Office exhibit at the George H.W. Bush Library and Museum Saturday, Dec. 1, 2018, in College Station. 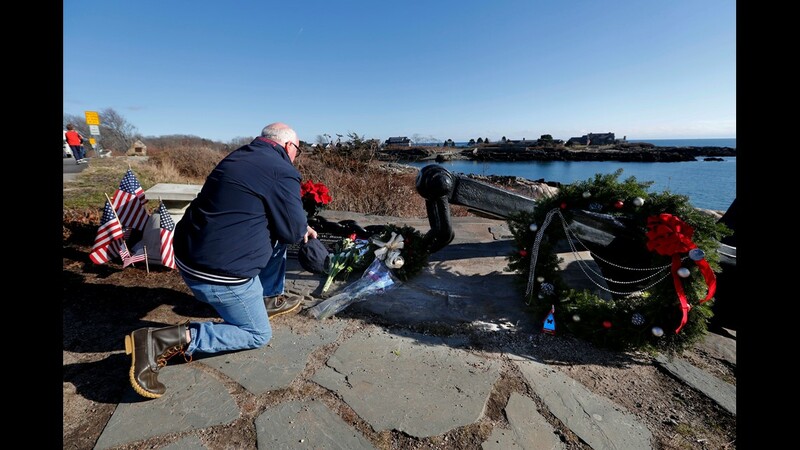 A man pays his respects to former President George H. W. Bush at a makeshift memorial across from Walker's Point, the Bush's summer home, Saturday, Dec. 1, 2018, in Kennebunkport, Maine. Bush died at the age of 94 on Friday, about eight months after the death of his wife, Barbara Bush. 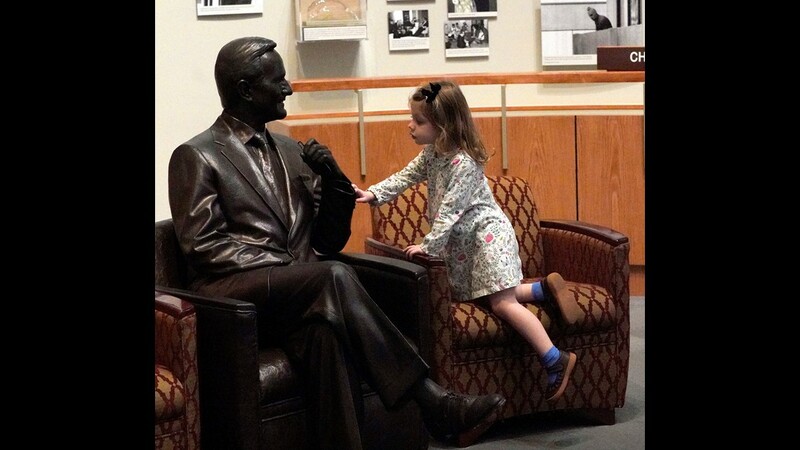 Caroline Western, 3, of College Station, Texas, touches at a statue of George H.W. Bush inside the George H.W. Bush Presidential Library and Museum Saturday, Dec. 1, 2018, in College Station. 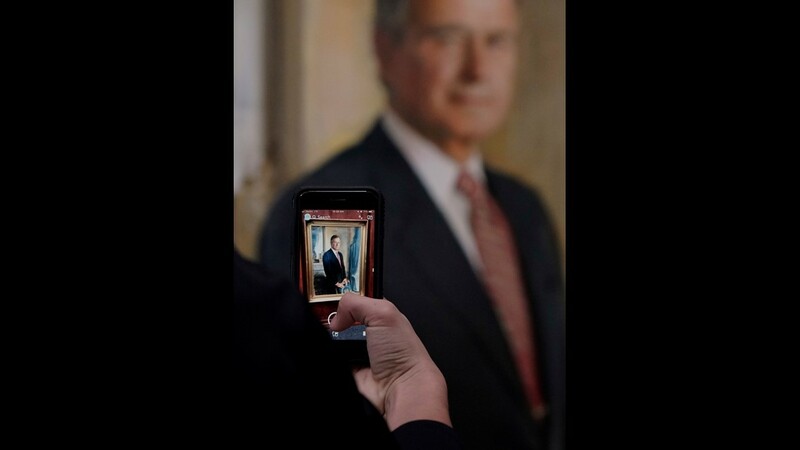 A visitor takes a photo of a painting of George H.W. Bush inside the George H.W. Bush Library and Museum Saturday, Dec. 1, 2018, in College Station. 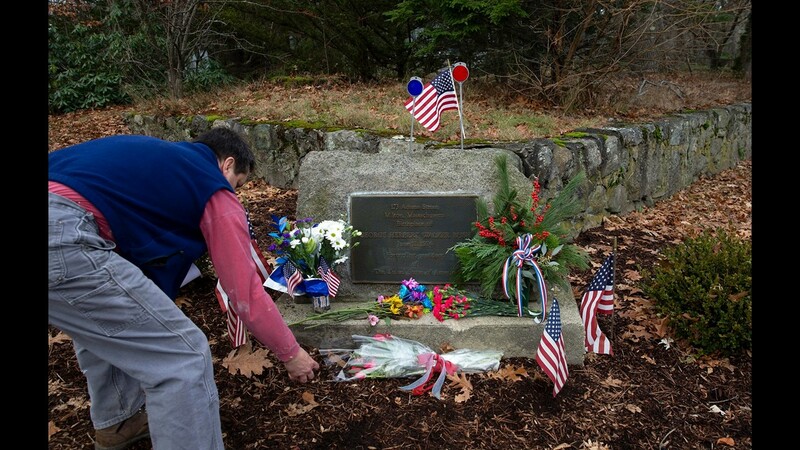 A passer-by cleans off the historical marker near the birth home of former United States President George H. W Bush in Milton, Mass. on Dec. 1, 2018. Visitors to the George H.W. 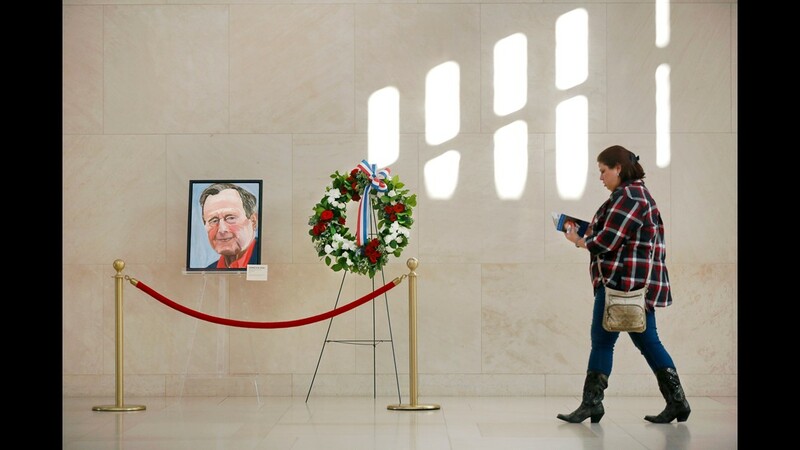 Bush Presidential Library and Museum sign condolence books Saturday, Dec. 1, 2018, in College Station. 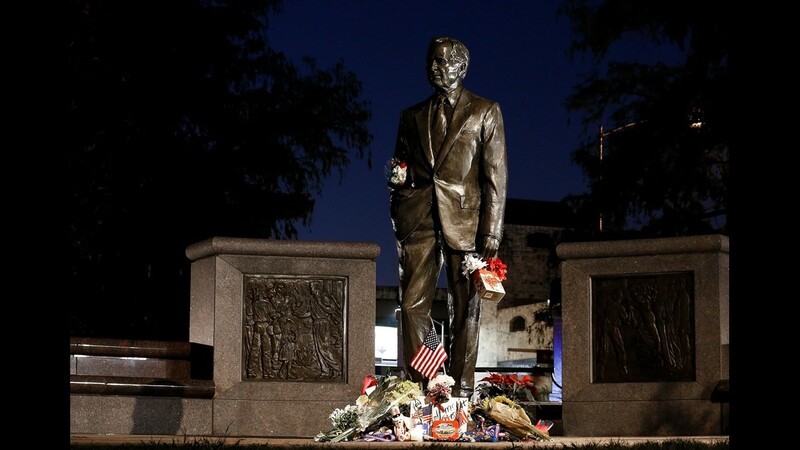 Flowers lay at the statue of former United States President George H.W. Bush near the Presidential Library in College Station, Texas on Dec. 1, 2018. 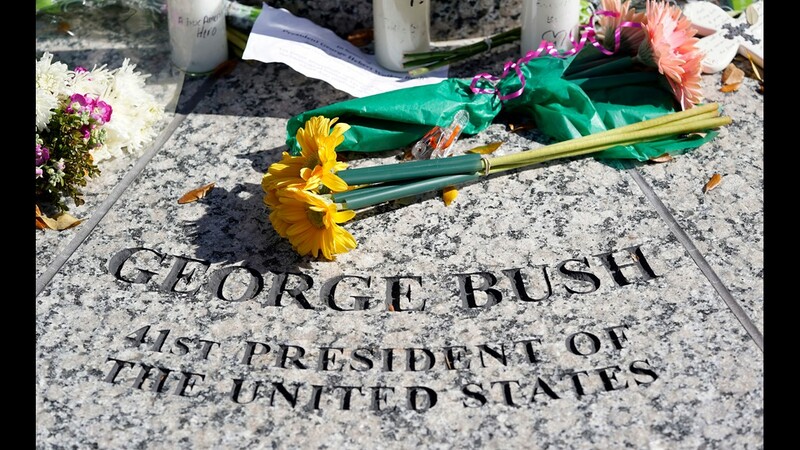 On Thursday, there were well-wishers again along the route of the special Union Pacific train that carried Bush’s casket from suburban Houston to College Station, Texas. Trains had provided the transportation for Bush when he left for aviator training at various naval bases, and when he came home after seeing combat for a wartime wedding to Barbara Pierce of Rye, New York. On Thursday, on his final journey, it was a train that carried him to his burial plot near his presidential library, on the grounds of Texas A & M. He was to be buried next to his wife of 73 years and daughter Robin, who died in 1953 at age 3 of leukemia. The night before the National Cathedral service, when Bush’s body was lying in repose at the Capitol Rotunda, there was the most poignant reminder of the Greatest Generation, and their passing. 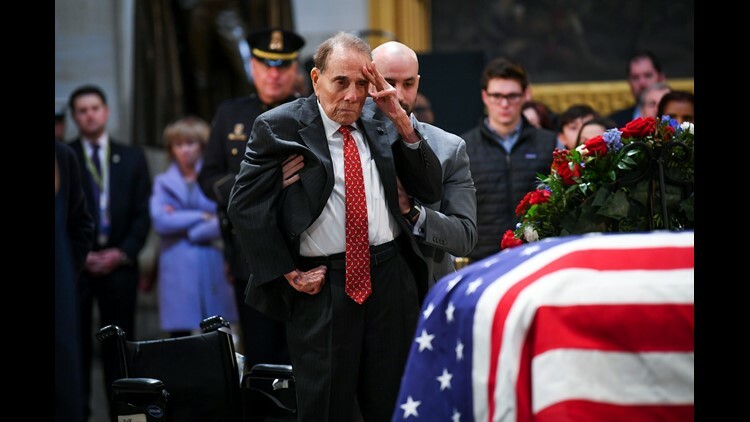 Former Kansas Senator Bob Dole arrived in the Capitol Rotunda to pay his respects to a one-time political rival who became a close friend, and a fellow veteran of World War II. The effort it took for Dole, 95, to stand from his wheelchair was etched in his face. The wounds he had suffered in battle so many decades ago robbed him of the use of his right arm. So he raised his left hand in a final salute. Former Sen. Bob Dole stands and salutes the casket of President George H.W. Bush who lies in state at the U.S. Capitol Rotunda.